Salar de Uyuni (or Salar de Tunupa) is the world's largest salt flat, at 10,582 square kilometers (4,086 sq mi). It is in the Daniel Campos Province in Potosí in southwest Bolivia, near the crest of the Andes and is at an elevation of 3,656 meters (11,995 ft) above sea level. The Salar was formed as a result of transformations between several prehistoric lakes. It is covered by a few meters of salt crust, which has an extraordinary flatness with the average elevation variations within one meter over the entire area of the Salar. The crust serves as a source of salt and covers a pool of brine, which is exceptionally rich in lithium. It contains 50% to 70% of the world's known lithium reserves. The large area, clear skies, and exceptional flatness of the surface make the Salar an ideal object for calibrating the altimeters of Earth observation satellites. Following rain, a thin layer of dead calm water transforms the flat into the world's largest mirror, 129 kilometres (80 miles) across. The geological history of the Salar is associated with a sequential transformation between several vast lakes. Some 30,000 to 42,000 years ago, the area was part of a giant prehistoric lake, Lake Minchin. Its age was estimated from radiocarbon dating of shells from outcropping sediments and carbonate reefs and varies between reported studies. Lake Minchin (named after Juan B. Minchin of Oruro) later transformed into Paleo Lake Tauca having a maximal depth of 140 meters (460 ft), and an estimated age of 13,000 to 18,000 or 14,900 to 26,100 years, depending on the source. The youngest prehistoric lake was Coipasa, which was radiocarbon dated to 11,500 to 13,400 years ago. When it dried, it left behind two modern lakes, Poopó and Uru Uru, and two major salt deserts, Salar de Coipasa and the larger Salar de Uyuni. Salar de Uyuni spreads over 10,582 km2, which is roughly 100 times the size of the Bonneville Salt Flats in the United States. Lake Poopó is a neighbor of the much larger Lake Titicaca. During the wet season, Titicaca overflows and discharges into Poopó, which in turn, floods Salar De Coipasa and Salar de Uyuni. Lacustrine mud that is interbedded with salt and saturated with brine underlies the surface of Salar de Uyuni. The brine is a saturated solution of sodium chloride, lithium chloride, and magnesium chloride in water. It is covered with a solid salt crust varying in thickness between tens of centimeters and a few meters. The center of the Salar contains a few islands, which are the remains of the tops of ancient volcanoes submerged during the era of Lake Minchin. They include unusual and fragile coral-like structures and deposits that often consist of fossils and algae. The area has a relatively stable average temperature with a peak at 21 °C in November to January and a low of 13 °C in June. The nights are cold all through the year, with temperatures between −9 °C and 5 °C. The relative humidity is rather low and constant throughout the year at 30% to 45%. The rainfall is also low at 1 mm to 3 mm per month between April and November, but it may increase up to 80 mm in January. However, except for January, even in the rainy season the number of rainy days is fewer than 5 per month. Incahuasi island in the center of the Salar. Salt production at the Salar. The Salar contains a large amount of sodium, potassium, lithium and magnesium (all in the chloride forms of NaCl, KCl, LiCl and MgCl2, respectively), as well as borax. Of those, sodium is arguably most important as it is vital for the human body. With estimated 9,000,000 t, Bolivia holds about 43 % of the world's known lithium reserves; most of those are in the Salar de Uyuni. Lithium is concentrated in the brine under the salt crust at a relatively high concentration of about 0.3%. It is also present in the top layers of the porous halite body lying under the brine; however, the liquid brine is easier to extract, by boring into the crust and pumping out the brine. The brine distribution has been monitored by the Landsat satellite and confirmed in ground drilling tests. Following those findings, an American-based international corporation has invested $137 million to developing lithium extraction. However, lithium extraction in the 1980s and 1990s by foreign companies met strong opposition from the local community. Locals believed that the money infused by mining would not reach them. Salar de Uyuni is estimated to contain 10 billion tonnes (9.8 billion long tons; 11 billion short tons) of salt, of which less than 25,000 t is extracted annually. All miners working in the Salar belong to Colchani's cooperative. Because of its location, large area, and flatness, the Salar is a major car transport route across the Bolivian Altiplano, except when seasonally covered with water. Salar is salt flat in Spanish. Uyuni originates from the Aymara language and means a pen (enclosure); Uyuni is a surname and the name of a town that serves as a gateway for tourists visiting the Salar. 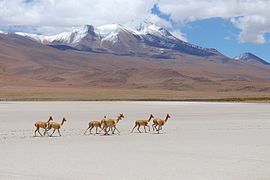 Thus Salar de Uyuni can be loosely translated as a salt flat with enclosures, the latter possibly referring to the "islands" of the Salar; or as "salt-flat at Uyuni (the town named 'pen for animals')". Aymara legend tells that the mountains Tunupa, Kusku, and Kusina, which surround the Salar, were giant people. Tunupa married Kusku, but Kusku ran away from her with Kusina. Grieving Tunupa started to cry while breastfeeding her son. Her tears mixed with milk and formed the Salar. Many locals consider the Tunupa an important deity and say that the place should be called Salar de Tunupa rather than Salar de Uyuni. The Salar is virtually devoid of any wildlife or vegetation. 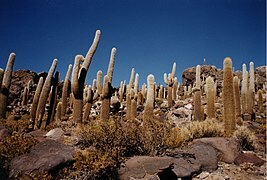 The latter is dominated by giant cacti (Echinopsis atacamensis pasacana, Echinopsis tarijensis, etc.). They grow at a rate of about 1 cm/a to a height of about 12 m. Other shrubs include Pilaya, which is used by locals to cure catarrh, and Thola (Baccharis dracunculifolia), which is burned as a fuel. Also present are quinoa plants and queñua bushes. Every November, Salar de Uyuni is the breeding ground for three species of pink South American flamingo: the Chilean, Andean, and rare James's flamingos, their color presumably originating from feeding on pink algae. 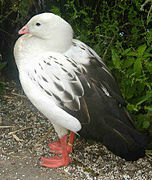 About 80 other bird species are present, including the horned coot, Andean goose, and Andean hillstar. 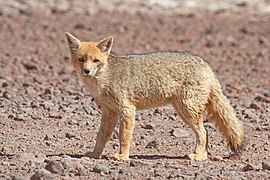 The Andean fox, or culpeo, is also present, and islands in the Salar (in particular Incahuasi Island) host colonies of rabbit-like viscachas. Traditional salt production at Salar. Such salt blocks are used for building salt hotels. Salar de Uyuni attracts tourists from around the world. As it is far from the cities, a number of hotels have been built in the area. Due to lack of conventional construction materials, many of them are almost entirely (walls, roof, furniture) built with salt blocks cut from the Salar. The first such hotel, named Palacio de Sal, was erected in 1993–1995 in the middle of the salt flat, and soon became a popular tourist destination. However, its location in the center of a desert caused sanitation problems, as most waste had to be collected manually. Mismanagement caused serious environmental pollution and the hotel had to be dismantled in 2002. One major tourist attraction is an antique train cemetery. It is 3 km outside Uyuni and is connected to it by the old train tracks. The town served in the past as a distribution hub for the trains carrying minerals en route to Pacific Ocean ports. The rail lines were built by British engineers arriving near the end of the 19th century and formed a sizeable community in Uyuni. The engineers were invited by the British-sponsored Antofagasta and Bolivia Railway Companies, now Ferrocarril de Antofagasta a Bolivia. The rail construction started in 1888 and ended in 1892. It was encouraged by Bolivian President Aniceto Arce, who believed Bolivia would flourish with a good transport system, but it was also constantly sabotaged by the local Aymara indigenous Indians who saw it as an intrusion into their lives. The trains were mostly used by the mining companies. In the 1940s, the mining industry collapsed, partly because of mineral depletion. Many trains were abandoned, producing the train cemetery. There are proposals to build a museum from the cemetery. Cemetery of trains near the town of Uyuni. Dried surface of the Salar. Salt flats are ideal for calibrating the distance measurement equipment of satellites because they are large, stable surfaces with strong reflection, similar to that of ice sheets. As the largest salt flat on Earth, Salar de Uyuni is especially suitable for this purpose. In the low-rain period from April to November, due to the absence of industry and its high elevation, the skies above Salar de Uyuni are very clear, and the air is dry (relative humidity is about 30%; rainfall is roughly 1 millimetre or 0.039 inches per month). It has a stable surface, smoothed by seasonal flooding — water dissolves the salt surface and thus keeps it leveled. As a result, the variation in the surface elevation over the 10,582-square-kilometer (4,086 sq mi) area of Salar de Uyuni is less than 1 meter (3 ft 3 in) normal to the Earth's circumference, and there are few square kilometers on Earth that are as flat. The surface reflectivity (albedo) for ultraviolet light is relatively high at 0.69 and shows variations of only a few percent during the daytime. The combination of all these features makes Salar de Uyuni about five times better for satellite calibration than the surface of an ocean. Using Salar de Uyuni as the target, ICESat has already achieved the short-term elevation measurement accuracy of below 2 centimeters (0.79 in). With the use of modern GPS technology, it can now be proven that the Salar de Uyuni is not perfectly flat. New measurements revealed previously missed features resembling ridges, hills, and valleys only millimeters in height. They originate from the variation in material density, and thus the gravitational force, beneath the Salar's sediments. Just as the ocean surface rises over denser seamounts, the salt flat surface also rises and falls to reflect the subsurface density variations. ^ "Salar de Tunupa". Iris en Tore op reis. 29 July 2011. Retrieved 2016-02-26. ^ Keating, Joshua (2009-10-21). "Bolivia's Lithium-Powered Future: What the global battery boom means for the future of South America's poorest country". Foreign Policy. ^ Borsa, A. A; et al. (2002). "GPS Survey of the salar de Uyuni, Bolivia, for Satellite Altimeter Calibration". American Geophysical Union, Fall Meeting. Bibcode:2002AGUFMOS52A0193B. ^ a b Hand, Eric (2007-11-30). "The salt flat with curious curves". Nature. ^ a b Fricker, H. A. (2005). "Assessment of ICESat performance at the salar de Uyuni, Bolivia" (PDF). Geophysical Research Letters. 32 (21): L21S06. Bibcode:2005GeoRL..3221S06F. doi:10.1029/2005GL023423. Archived from the original (free download pdf) on 2009-03-20. ^ a b Reuder, Joachim; et al. (2007). "Investigations on the effect of high surface albedo on erythemally effective UV irradiance: Results of a campaign at the Salar de Uyuni, Bolivia" (PDF). Journal of Photochemistry and Photobiology B. 87 (1): 1–8. doi:10.1016/j.jphotobiol.2006.12.002. PMID 17227712. Archived from the original (free-download pdf) on 2014-04-14. ^ a b Lamparelli, R. A. C.; et al. (2003). "Characterization of the Salar de Uyuni for in-orbit satellite calibration". IEEE Trans. Geosci. Remote Sens. 41 (6): 1461–1468. Bibcode:2003ITGRS..41.1461C. doi:10.1109/TGRS.2003.810713. ^ Kingdoms of the Sky: Salt Flat Landscape Creates the World's Largest Mirror PBS, 2018-07-25. 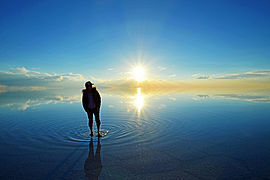 Quote: "Sudden rains leave a layer of dead calm water just an inch deep, turning the salt flat into a natural wonder: the world's largest mirror, eighty miles across. At night, the landscape is transformed again into a 360-degree starscape. This dazzling show is only possible because the Salar de Uyuni is perfectly flat." ^ a b "Salar de Uyuni, Bolivia". NASA Earth Observatory. Retrieved 2007-12-01. ^ Bowman, Isaiah (1914). "Results of an Expedition to the Central Andes". Bulletin of the American Geographical Society. 46 (3): 161. JSTOR 201641. ^ Baker, P. A.; et al. (2001). "Tropical climate changes at millennial and orbital timescales on the Bolivian Altiplano". Nature. 409 (6821): 698–701. doi:10.1038/35055524. PMID 11217855. ^ a b c d e f Atkinson, David (2007-03-01). Bolivia: The Bradt Travel Guide. Bradt Travel Guides. pp. 170, 174–176. ISBN 978-1-84162-165-4. ^ "Lithium Statistics and Information" (PDF). USGS. ^ "In search of Lithium: The battle for the 3rd element". Dailymail. 5 April 2009. ^ National Research Council (U.S.). Board on Science and Technology for International Development, National Research Council (U.S.). Office of International Affairs (1988). Science and technology for development: prospects entering the twenty-first century : a symposium in commemoration of the twenty-fifth anniversary of the U.S. Agency for International Development. National Academies. p. 60. ^ "Bolivia holds key to electric car future". BBC News. ^ "Bloomberg - Are you a robot?". www.bloomberg.com. Retrieved 2019-03-26. ^ "Bolivia holds key to electric car future". BBC. 2008-11-09. ^ "Bolivian Hotel Truly Is the Salt of the Earth". hotelchatter.com. January 27, 2009. ^ "Don't Lick the Walls of the Salt Hotel". tripcrazed.com. 19 May 2009. Archived from the original on 23 May 2009. ^ McFarrren, Peter (1999-03-04). "Salt hotel has a rule: No licking". The Associated Press. ^ Box, Ben; Kunstaetter, Robert; Kunstaetter, Daisy; Groesbeck, Geoffrey (2007). Peru, Bolivia & Ecuador. Footprint Travel Guides. p. 378. ISBN 1-906098-06-9. ^ "Photo in the News: New Salt Hotel Built in Bolivia". National Geographic. 2007-07-25. Retrieved 2009-09-01. ^ Adès, Harry (2004). The Rough Guide to South America. Rough Guides. p. 259. ISBN 1-85828-907-6. ^ "Palacio del Sal". hbernreuther.de (in German). Archived from the original on 2008-12-06. ^ a b "The Hills And Valleys Of Earth's Largest Salt Flat". GPS Daily. 2007-11-29. ^ Spreen, Gunnar (2008). Satellite-based Estimates of Sea Ice Volume Flux: Applications to the Fram Strait Region. GRIN Verlag. p. 22. ISBN 3-640-13064-2. ^ Bills, Bruce G.; et al. (2007). "MISR-based passive optical bathymetry from orbit with few-cm level of accuracy on the Salar de Uyuni, Bolivia". Remote Sensing of Environment. 107 (1–2): 240–255. Bibcode:2007RSEnv.107..240B. doi:10.1016/j.rse.2006.11.006. 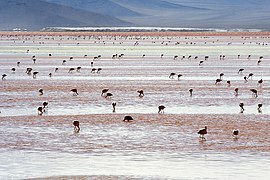 Wikimedia Commons has media related to Salar de Uyuni.